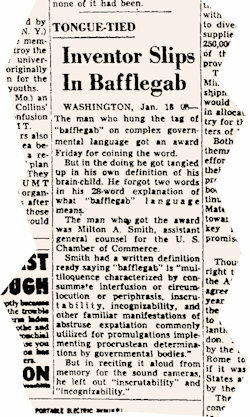 How the award was reported in the Salt Lake Tribune on 19 January 1952. Milton Smith coined the word in a piece he wrote for the Chamber’s weekly publication, Washington Report, which criticised the OPS for the bureaucratic language it used in one of its price orders. This was picked up by the Bellingham Herald in Washington State, which wrote an editorial about it, saying “Gobbledegook is mouth-filling, but it lacks the punch of bafflegab. The inventor of that one deserves an award.” The newspaper made sure he got one by paying for the plaque to be made and organising its presentation. The inventor said he had spent a maddening day trying to explain the OPS order to a colleague and decided a special word was needed to describe its special blend of “incomprehensibility, ambiguity, verbosity and complexity”. He tried legalfusion, legalprate, gabalia, and burobabble before settling on bafflegab. There’s nothing mysterious about the make-up of the word, and that’s part of its appeal. But it’s the stress on those plosive consonants that really makes it fly. It might well have succeeded even without the publicity associated with the award. At the presentation, Milton Smith was asked to briefly define his word. It was, he said succinctly, “multiloquence characterized by consummate interfusion of circumlocution or periphrasis, inscrutability, and other familiar manifestations of abstruse expatiation commonly utilized for promulgations implementing Procrustean determinations by governmental bodies.” Just so.